The blog and the monastery. A mural of Great yogi the Phajo and his sons. Tango Monastery is a national heritage as we all know. Not just because it is a monastery founded by a great saint but also because it houses century old precious arts and paintings beside the places and relics of sacred importance. Tango is quite internationally known for its well preserved age old ancient arts and paintings of great skills. The murals in Tango are recognized as the best murals in Bhutan and in the world and are greatly appreciated by national and international conservationist and the art experts. These paintings according to the national conservationist Tashi Lhendup have the best materials, superb in artistic skills and techniques. The mural conservation in Tango is expected to start in May this year(2015). Therefore I would here like to highlight a piece of information on a part of paintings of Tango Monastery which was quite untold. An article published in English (Probably translated) by Centre for Bhutan Studies (CBS) authored by Tshenyed Lopen Kuenleg explicitly says that all the paintings of Tango Monastery is the work of painter Jangchub Sempa. 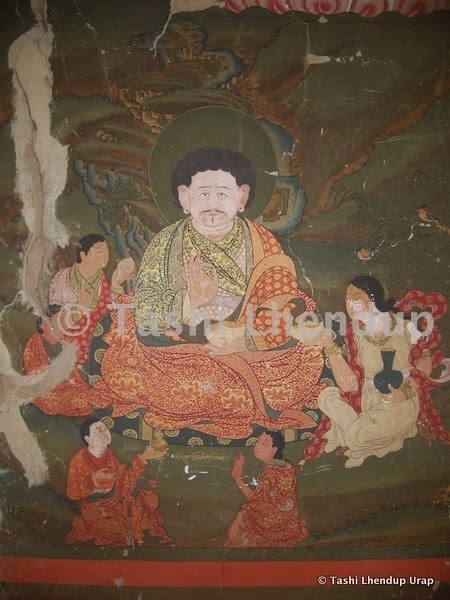 “The wall paintings on all the 3 stories are the real work of the great painter Jangchub Sempa,” Tshenyed Lopen has said in his article (English version, CBS) unlike the different attribution mentioned in biography of Desi Tenzin Rabgye. The biography of Desi Tenzin Rabgye by Je Ngagwang Lhuendrup which I believe is the ultimate source of information on Tango Monastery deviates from what is said in the article of Tshenyed Lopen and attributes different painting to different painters. For instance, according to the biography, the paintings of the ground floor known as the Tsang-khang wogma Trulkuyi lhakhang (གཙང་ཁང་འོག་མ་སྤྲུལ་སྐུའི་ལྷ་ཁང་། in the biography) with Lord Buddha as the main object of worship was said to have the paintings done by a Sumthrang Choeje. “At the right the painting of Lopen Pema and his two consorts as the main painting with the paintings of Vajradhara, Choejye Tsangpa, Zhabdrung, Dragpo Phurshamchen, Je Rinpoche, Jetsuen Tenzin, Palgoen Chagzhipa, Leygoen. At the left the main painting of Hayagriva with the paintings of Amitabha, Vajrasattava, the seven successive Buddhas, sixteen Arhats, Dorji Phagmo, Mithrugpa, Dorji Rabgye, Rinchen Zangpo, Drukpa Kinleg, Phajo and his sons, Ngagwang Tenzin, Tsewang Tenzin, Lhamo, Namsey, Tsen and Bagyoedpa and over the door the painting of eight main Bodhisattavas are done by Sumthrang Choejye and his pupils,” Je Ngawang Lhuendrup writes (Pg 220 or Eng Pg no. 00441 TBRC image: My own loose translation). The Sumthrang Choeje mentioned above was probably the Penchen Ngagwang Sonam who was the younger brother of the 16th Sumthrang Chojey Pema Choerab. Pema Choerab was born in 1627 therefore Penchen Ngawang Sonam should probably be born few years later after his elder brother. The year therefore fits well with the year of Tango’s construction in 1688 corresponding to Earth Dragon year of the 12th Rabjung. However the article in CBS coordinates 1689 as the corresponding year to Earth Dragon year of the 12th rabjung. Penchen Ngawang Sonam has joined the Zhung Dratsang at his early age while his elder brother took the seat of Sumthrang after their father the 15th Sumthrang Choejey Gyelsey Nedrup. 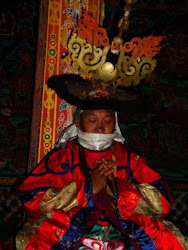 He was ordained from Khenchen Pekar Jungnye and has studied under the great scholar known as Tandin Wangyel. Since his mid age after completing his studies he was mostly known as the Sumthrang Choje among the monastic members. Therefore the attribution in Desi Tenzen Rabgye’s biography as Sumthang Choje. Penchen Ngawang Sonam later has also served the Central Monastic body as one of the Lopen Zhips probably as Tsugla lopen according to Dasho Lam Sanga's Drukgi Nyorab Selwi Melong 1998. Do-Ngoen (blue stone) dzong: Does our history tell us the truth........? Chojey Wangdra Jamtsho is the current seat holder and is 27th Sumthrang Chojey from among the 45 generation of Nyo linage in Bhutan. He has been pursuing restoration of the monastery and reviving of the monastic culture and traditions of Sumthrang since the year 2000. All rights reserved: Sumthrang Monastery. Simple theme. Theme images by molotovcoketail. Powered by Blogger.